Last Thursday I was invited to hold an improv workshop on creativity at Forbes Summer School. And as it happens so often (if you pay attention & notice), an interesting coincidence occurred: I recently read a book on this subject, that a colleague from work thought I might find interesting. It’s my opinion that creativity is the ability to give multiple answers to the same problem and to be able to make connections between things that are not normally connected. With that definition in mind I am convinced that creativity is a normal skill as listening, problem solving, public speaking and others are. We can all listen, solve problems, speak and we are all creative, but some of us are better than others. We all have the ability to make connections because this is how our brains work. It’s just that we have to practice so that we can connect as many things as possible, as fast as possible. You practice active listening by listening, public speaking by speaking in public, problem solving by solving some problems … and receiving feedback for your work so that next time you do better. You practice creativity by being creative. As often as you can. All the time if possible. Creativity is not a skill you can achieve if you focus really hard one day. It has to be part of you everyday. 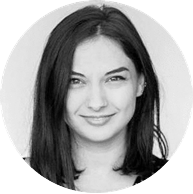 We say a person chose/has a creative job (writer, copywriter, designer, you name it) because she IS creative. So just BE creative if you want to boost your creativity. You know…be the change you want to see in the world. Here I return to the book I mentioned I read. It’s not a complicated book that reveals the most secret of them all when it comes to creativity, but it has some great ideas of what to do to be creative everyday (so that you can use the skill when you really need it). 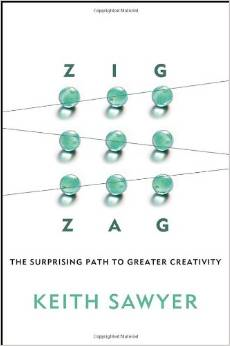 Keith Sawyer proposes, in Zig-Zag – The surprising path to greater creativity, eight steps (that should be practiced continuously, in no particular order). And the books has a bunch of great exercises/activities/ideas that you can do at each step. At the workshop we practiced the Look, Play, Think, Fuse and Make steps. Wasn’t easy but, in the end, the participants, maybe forgetting they’re in a workshop and being taken by the fun wave of creativity, started to create really great stuff. PHOTOS: Starting from the word “TREE” they had to build statues. They were coached to be more and more creative, to make different connections, and you can see how the statues started to be different as well. Being creative helps you to be a better problem solver, to better adapt to the situations and world around you, to be more productive and to have more fun. And if that’s not enough I think that being creative actually helps you to keep your mind sharp and your brain plastic thus able to learn. Practicing making connections helps your brain to light up. As we go to the gym to train our muscles to stay fit, being creative daily is like a training to keep our brain fit. Don’t take my word for it, be creative for a week or two and see what happens! If you haven’t figured out just yet what that was here it is: creativity is a skill we all have, but that we need to practice everyday in order to reach our creative potential. It’s not a train-it-when-you-need-it type of skill. And the best way to practice creativity is to act as if you are already creative, thinking and behaving as a creative person would do. As much as you can.